Craving something salty and savory?? Try Trader Joe's Roasted Plantain Chips. 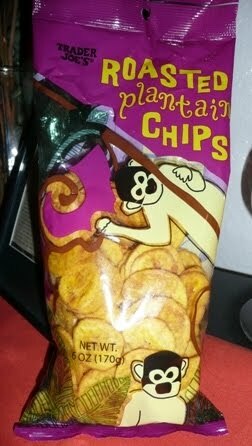 Some may think, hmmm--plantains...these chips must be sweet, but stop right there! This delicious, savory snack is roasted in sunflower oil and dashed with salt. They are not fried and full of yummy nutrients common in plantains! Be extremely careful when deciding to open a bag because once you have one plantain chip, there is no going back. Before you know it the whole bag will be gone. But nothing to fear, 20 chips are only 120 calories (6 servings per bag)! That's as guilt free as the price which is around $2 bag! Happy snacking! Call me skinny, but when life throws you lemons, open a bag of Trader Joe's Roasted Plantain Chips. She is totally right!! The plantain are absolutely delicious and once you start, there is no going back!! Perfect snack.